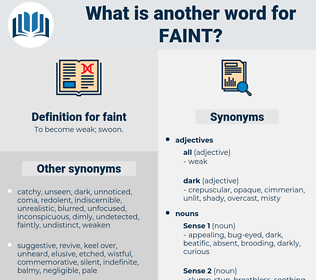 What is another word for faint? fromming abusing substance black out. weak, pale, low-intensity, low, feeble, light, bleak, tenuous, little, minor, mild, insignificant, dim. colorful, friendly, near, rough, heavy, thick, intelligent, definite, sharp, strong, certain, bold, healthy, boisterous, courageous, smart, violent, uncontrolled, firm, sure, warm, distinct, brave, harsh, clear, bright, close, loud, nearby, resolute. strengthened, muscular, mighty, hard, hardened, strapping, invigorated, plain, hardy, capable, athletic, stout, sound, husky, fresh, unperceivable, sinewy, fit, fortified, hale, able-bodied, well, imperceptible, evident, beefy, recovering, obvious, sturdy, brawny, tough, stalwart, toughened, Vitalized, powerful, rugged, pellucid, brilliant, virile, daring, competent, hearty, inured. strengthen, ascend, rise, win, reach, improve. Again a faint smile showed itself on Antony's face. If you're going to talk so much, Sue, you ought to have some faint idea what you're talking about! fend, fonda, faineant, fomite, femininity, fond, fount, fiend, fan out, fine-tooth, funded, Finnan Haddie, fondu, fanned, five-pointed, find out, founded, foment, found, finite, fanweed, feint, fondue, fumed, Famed, fine-toothed, fund, fined, font, find, finitude. zonk out, black out, pass out.